Barisheff says, “We’ve passed the point of this getting fixed.” Barisheff thinks if the Fed’s gold holdings are ever audited, there will be a “gigantic short-covering rally . . . multiple bankruptcies . . . and a massive loss of confidence” in the dollar because much of the gold is gone or leased out. 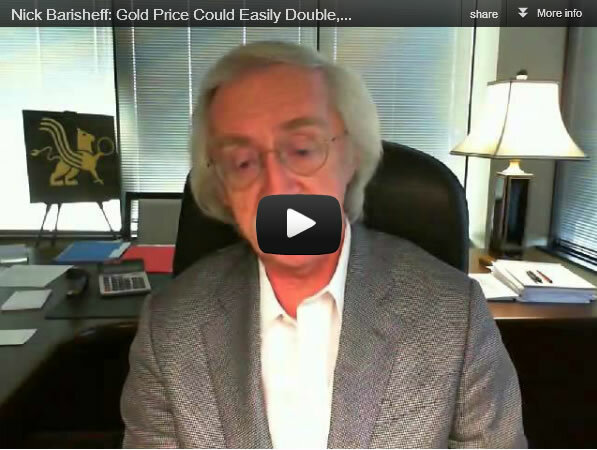 Barisheff thinks the gold price could be “easily double” right now. That’s because Barisheff believes, “What’s kept the price down is the artificial leased gold going onto the markets.” Join Greg Hunter as he goes One-on-One with Nick Barisheff, CEO of the $650 million Bullion Management Group. © 2012 Copyright Nick Barisheff - All Rights Reserved Disclaimer: The above is a matter of opinion provided for general information purposes only and is not intended as investment advice. Information and analysis above are derived from sources and utilising methods believed to be reliable, but we cannot accept responsibility for any losses you may incur as a result of this analysis. Individuals should consult with their personal financial advisors.